We are lucky to have had more than one “partner” for several of our galleries. We start by sourcing artists from already established community groups like grade school art classes, cub scouts, dance teams and the Edina youth football program! Then we add a second partner! A non-profit organization. We choose non-profits that are active in the local community or have previous relations with our team. We work as a group to create a large scale art project that will help spread awareness of the non-profit. These are very special projects for us. During the Spring of 2017 the entire second grade class from Concord Elementary created over 120 “stained glass” dragonflies. 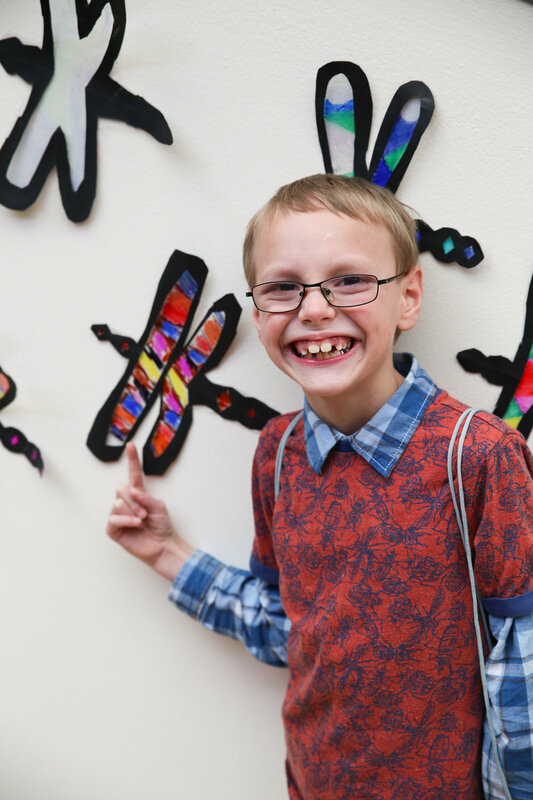 The dragonflies were displayed at Southdale Center in honor of Abbey’s Hope Foundation. Abbey was a young girl (and a student at Concord) who passed away as a result of a tragic swimming pool accident. She loved dragonflies & therefore they are the logo of Abbey’s Hope Foundation. The Concord students created the dragonflies in her honor. We hung them in the Southdale Center Atrium where they were on display for over 6 months. We also shared a bit of Abbey’s story and information on swimmer safety on a poster alongside the display. The artists had the opportunity to meet representatives from Abby’s Hope and learn about swimmer safety at the launch party. Over 150 paper lanterns were installed on November 12th, 2017 by Art of Edina at Southdale Center. The installation was a part of the Shine On Project. The lanterns were created by the 4th and 5th grade classes at Our Lady of Grace Catholic School. The art project was overseen by Amy Slack. Installed just in time for the holiday shopping season - the installation focused on joy and light around the world. Kare11 News broadcasted their live 3 hour Saturday morning news show from our launch party! This was a collaborative project with the Minneapolis-based American Refugee Committee (ARC). Photos taken by a group of travelers that visited the Nakivale Refugee Settlement with ARC in Uganda were also a part of the installation. The sponsor, Tradition Companies, donated one solar-powered headlamp in the honor of each OLG student that had a lantern displayed! The headlamps were sent to the refugee settlement in Uganda and given to a person without electricity in their home. Jill Emmer (Owner of Shine On Photos & Director of Art of Edina) was inspired by the momentum of this project and continued to raise money in her community. She recruited friends, fellow artists and community members to help. They had art sales, yoga classes, cocktail parties and more. In the end, the Shine On Project raised $15,000 in three months! All of the money that was raised was used to purchase solar powered headlamps for refugees in Uganda! The lights were delivered to the refugees by the American Refugee Committee. 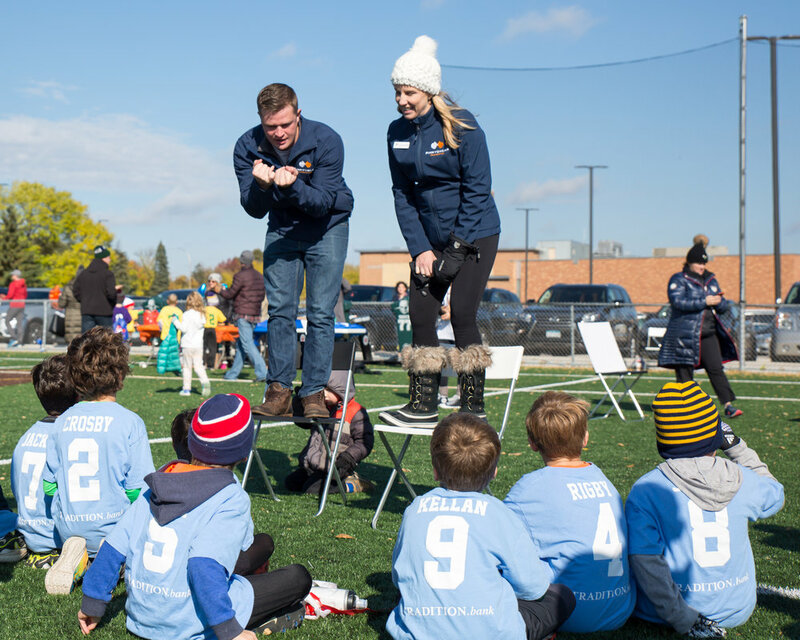 We were proud to be the organizers of “Pinky Swear Day” in partnership with the Edina Football Association on Saturday October 13, 2018. All 2nd, 3rd, 4th and 5th grade Edina Football Association players were able to learn about the Pinky Swear Foundation and participated in a “hands on” project. The Pinky Swear Foundation is a Minnesota non-profit that has been supporting kids with cancer for over 15 years. First, the Pinky Swear director, Erica Campbell, briefly spoke with each set of teams. She told them about the organization and the importance of supporting friends, family and people in our community! 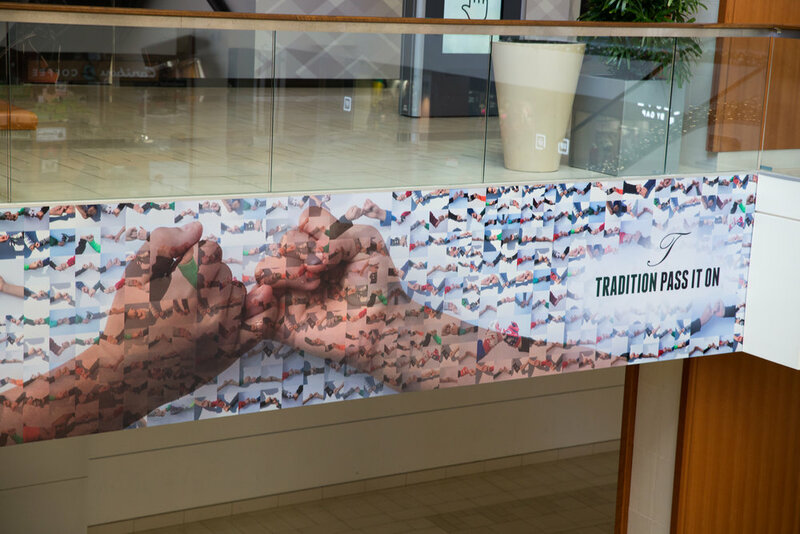 Afterwards the Art of Edina edited all of the photos together and made a 25 foot banner that was displayed for over 3 months at Southdale Mall! The display also included photos from the “Pinky Swear Day” event, information on all parties involved and a special area for one of the EFA players to tell his story and his experiences with Pinky Swear.